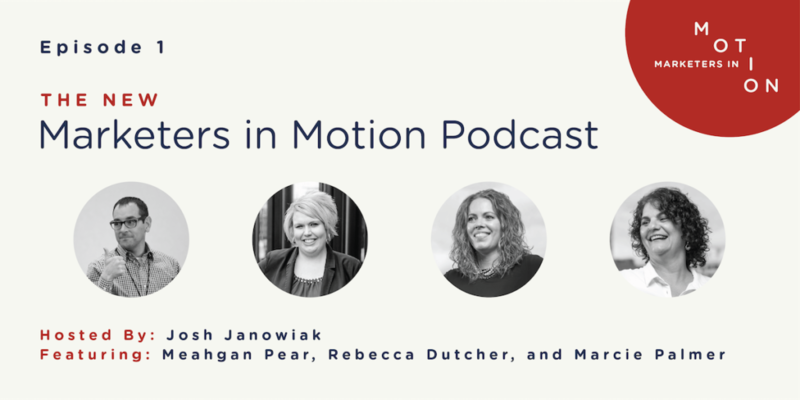 The New Marketers In Motion Podcast is Here! The Marketers In Motion Podcast is powered by the West Michigan Chapter of the American Marketing Association. Marketing is our passion, and as a Chapter we hope to inspire dialogue, fuel creativity, and create a community for marketers everywhere. In 1953, Neil Borden transformed the business world when he articulated the strategy of “Marketing Mix” in his AMA presidential address. Borden was just one of many AMA leaders who were not satisfied with existing best practices. These thought leaders sought answers for the future that would propel business growth and elevate the role of marketing. Today, the AMA leads an unparalleled discussion on marketing excellence. Continuing in the tradition of Borden and so many others, the AMA offers differentiated content that focuses on the tension between Best Versus Next Practices™. Founded in 1952, AMA West Michigan has provided marketers with the resources, information and knowledge to grow in their careers and shape successful businesses.We’re an organization made up of members that strive to inspire dialogue, inclusion, passion, and creativity. It’s our duty to set an example. The idea of launching a podcast was the “Epic Goal” that hatched out of the 2018-19 annual strategy session. Our team is thrilled to have reached this goal so early in the new year. The goal for the podcast is to inform listeners about the national and worldwide marketing concepts that are discussed on a local level at our West Michigan Chapter Events. After each monthly Marketing Luncheon, our team will host that month’s presenter for a podcast that will recap the event presentation and take a deeper dive into specific topics. The podcast episodes will capture informal, topical, and fun conversations surrounding important marketing concepts. Our experienced AMA West Michigan board members and volunteers will frequently be featured as co-hosts and will contribute their industry knowledge surrounding each topic. In this podcast we’ll talk about how companies need to build partnerships in order to differentiate themselves in today’s business environment- and why it’s more important than ever to listen to consumers (and not necessarily the trade). We’ll discuss the challenges and learnings that Boxed Water has faced in its first decade and how to you can apply them to your organization. Key takeaways from this podcast will include…. Did you know there are over 5000 marketing technologies available to take your marketing and its operations to the next level? To be a successful marketer today, you must understand and leverage a wide variety of innovative marketing technologies to conduct marketing activities and create memorable customer experiences. During this podcast, we’ll discuss some of the most innovative technologies available to marketers today while sharing experiences on effectively integrating these technologies into our marketing strategy and operations. With “Baby boomers” continuing to exit the workforce at a rapid rate, relationships between buyers and sellers are changing more rapidly than ever. Learn how to design winning processes and use technologies to help your business cultivate new relationships and secure existing relationships in the digital age. Key technologies for discussion: CRM, Social Media, Marketing Automation. The silos between sales and marketing are legendary. If you’ve ever worked for an organization where the two departments live together in peace and harmony; consider your company a unicorn! It’s more common to hear how marketing folks think sales is comprised of a bunch of lazy divas and how sales folks think marketing is a bunch of creatives who make branded coffee cups and T-shirts (and don’t generate any real value). The evolution of marketing- the digital transformation of marketing – makes it possible to qualify and quantify marketing’s value and enforce the rules by which sales’ engages with potential customers. But only if you put the right processes and systems in place. Jennifer Jurgens of 1 Bold Step will be sharing insights on how the emerging field of marketing operations and the transition to “self-educating buyers” has changed the sales and marketing dynamic to one of the interwoven dependencies, with marketing coming first. From inbound strategies to a demand generation waterfall, to the necessary elements in a service level agreement between sales and marketing, attendees will leave with some helpful tools to start breaking down silos and creating a path to marketing and sales nirvana. Jen is a catalyst that loves to make everything she touches somehow better, faster, and more efficient. And while her career choices may seem unrelated, the thread that ties them together is that she brought order, process, growth and scale to every organization she’s worked with. From creating some of the first hosted e-commerce solutions at Pandesic (an IntelSAP venture), to working with The HON Company, Konica Minolta, Safety-Kleen, Adtegrity, USXchange, Mindpepper, and others to bring process and marketing ROI, to serving as executive director for Susan G. Komen Michigan, and most recently, scaling growth as the president of SalesPad, Jen brings clarity to the complex and builds trust-based teams that keep companies moving forward. The American Marketing Association is the largest professional marketing association in the world, with members who work, teach and study in the field. By becoming a member, you gain access to a vast body of marketing knowledge, high-quality training programs, the latest tools and tactics, exposure to leading-edge thinking, and opportunities to interact with marketing peers around the world. Becoming a sponsor of the AMA is a savvy move that is packed full of benefits. Sponsors are able to present their brand in front of a captive audience from a variety of companies large and small. Plus, you’ll have a team of expert-level marketers pushing your brand out in effective and creative ways. Our team of talented social media experts, amazing designers, email marketing rockstars, and marketing masterminds can work with you to craft a unique message and choose the channel that reaches your desired target audience! Our different levels of sponsorship allows you to choose the best investment for you, while our team strives to provide an outstanding ROI. We couldn’t do what we do without your support. Therefore, we strive to provide outstanding sponsor benefits to help you get closer to reaching your goals. What is your favorite personal development, business or marketing related book? If you could boil what you’ve learned in your career down one piece of advice for others, what would it be? Trust Your Gut & Be Dependable. Trust in others and build your team out of complimenting skill sets. Teamwork makes the dream work!